Success Versus Happiness - What is More Important? Home » Happiness & SWB » Success Versus Happiness – What is More Important? What is more important to you, happiness or success? According to psychologist Daniel Gilbert, who is a psychology professor at Harvard, happiness is the ultimate goal of virtually all the decisions we make in life (Gilbert, 2010). Gilbert suggests that the measure of a good decision depends on whether that decision brings us pleasure, a sense of well-being, happiness or contentment. Researchers have focused a lot more on happiness in the past few years and science has finally started to pay attention to what it really means to be happy. According to research done by Sonja Lyubomirsky PhD. in the book The Happiness Diet, forty percent of our happiness may actually be within our power to control (Lyubomirsky, S., 2008). Lyubomirsky has been studying happiness for nearly two decades and her research is leading the way in scientific study for interventions that can help increase human happiness. So in light of all of this, we have to ask ourselves, which comes first – happiness or success? The real truth is that happiness is often subjective and difficult to measure. Success is often judged externally or by comparison to other people. Happiness is usually an attribute of an individual whereas success can be attributed to an individual or to a group. Happiness is a goal that many people aspire to. Most people also have a strong desire to be successful in life and they tend to believe that through this success they will automatically become happier. While we may never know with 100% certainty which one is more important, we do know that success and happiness are inextricably linked. Does Success Bring Happiness and Fulfillment? According to Lyubomirsky, et al., (2005) numerous studies have shown that happy people tend to be successful across multiple domains in life, including work performance, health, income, friendship, and even marriage. The authors have devised a conceptual model that accounts for these findings. They argue that the happiness-success link exists not only because success makes people happy, but also from the positive affect engendering success. The results of the findings revealed that happiness is associated with and precedes numerous successful outcomes. Moreover, it was also discovered that certain behaviors tended to parallel that success. The evidence suggests that the idea of positive affect, the hallmark of well-being, may actually be the cause of many of the desirable characteristics, resources, and successes correlated with such happiness. The real question then becomes, what comes first, happiness or success? This is akin to the chicken and egg scenario as well. If happiness comes first, then you must surmise that you have to figure out how to be happy before your success will come rolling in. On the other side of the coin is the idea of success coming first, before happiness. What does it take to really be happy? Do you have to be successful in order to be happy? There are most likely millions of people in the world who would disagree with you on that point because success does not guarantee happiness. There are just as many people out there who deem themselves happy, while not necessarily successful, as there are successful people still trying to figure out how to be happy. How do these two constructs tie together? That is the issue we will discuss. According to the fight or flight theory, humans were not wired for happiness, they were wired for survival. Many of us find ourselves rushing through life, chasing happiness. The problem is that we never quite get there. For many of us, happiness is something we aspire to. Happiness is somewhere we get to someday. What we fail to recognize is that happiness is a state of mind, not a destination. We know happiness is not a static state, because even the happiest people feel blue sometimes. Norrish and Vella-Brodrick (2008) studied whether happiness is even a worthwhile pursuit. 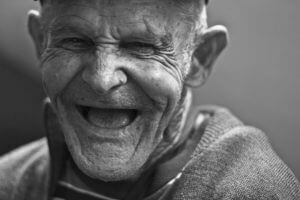 Happiness, the pursuit of it, and what it means to live a good life has been long debated. People are increasingly looking for new ways to become happier. This is indicated by the growing demand for self-help books and literature. Only recently have social scientists begun to really study happiness. According to Norrish and Vella-Brodrick (2008), psychology has traditionally been a healing profession that has been mainly focused on pathology, dysfunction and mental illness. Some social scientists have even gone as far as suggesting that investigating human emotions is a luxurious or even indulgent goal in comparison to the importance and the need to understand human suffering. 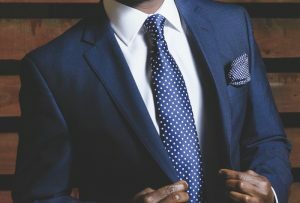 Some scholars in the field go as far as saying that psychology’s more traditional negative perspective ignores the more positive aspects of human functioning. Thankfully this is rapidly changing with the advent of the positive psychology movement. Defining happiness is not an easy task. Everyone defines it differently. Some people may find happiness in simple small things like a day in the park or a happy moment. Other people may find happiness more of an elusive quality. Research in positive psychology defines a happy person as someone who experiences frequent positive emotions, such as interest, joy and pride, and infrequent negative emotions such as sadness or anxiety. (Lyubomirsky et al., 2005). Happiness is also related to life satisfaction, appreciation of life and moments of pleasure. Overall, happiness has to do with the positive experience of emotions. 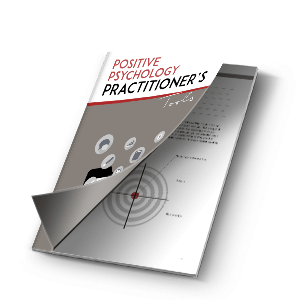 According to Norby, 2013 positive psychology helps provide methods that help us rethink the way we work. Not only does it provide us with tools that help inoculate us against stress, but it also shows us how we can achieve a state of happiness that is a more effective way to work or accomplish a task. Norby compares our mind and brain to actors on a stage. The actors on the stage in your brain affect what you are thinking about and how to get to a possibility. Shawn Achor, the author of “Happiness Advantage” undertook an experiment where he delivered three hours of positive psychology training to a group of people. After the experiment, Achor returned to gauge the success of the training. The testing showed that in a very short period of time the group measured significantly higher life satisfaction scores and lower stress scores than those who did not receive the training. The happiness advantage: How happiness gives your brain and organization the competitive edge. The fulcrum and the lever: Changing your performance by changing your mindset. The Tetris effect: Training your brain to capitalize on possibility. Falling up: Capitalizing on the downs to build upward momentum. The “Zorro” circle: How limiting your focus to small, manageable goals can expand your sphere of power. The 20-second rule: How to turn bad habits into good ones by minimizing barriers to change. Social investment: Why social support is your single greatest asset, or not to retreat into yourself. However, this definition falls short in many ways. Success is much more than mere financial success because you must also feel successful in other areas of life such as love and relationships, health, and more. In the end, success is much more than just wealth and power. Barbara Bush defined success as how you treat others, from family to strangers. Albert Schweitzer defined success as loving what you do. Zappos CEO Tony Hsieh says success is all about living in accordance with your values. Author Maya Angelou believed success is about enjoying your work. Billionaire Richard Branson believes success is about engagement. The best definition of success may just be author Stephen Covey’s definition when he stated that success is deeply individual. Thinking of how you would best define your life and your idea of success at your deathbed, may, in fact, be the best way to get crystal clear on your idea of success. When it comes right down to it, success and monetary wealth don’t necessarily equate to happiness and security. It doesn’t do you much good in terms of your level of happiness if you are successful monetarily, but miserable in your personal life. On the other hand, you may be incredibly happy with your personal life or other relationships, but still struggling with success or struggling financially. Both of these indicators are interconnected in a sense. Happiness affects your level of success and your level of success affects your happiness. Norrish and Vella-Brodrick (2008) talk about the happiness set point, also called the dynamic equilibrium theory. This idea surmises that despite changes in your individual circumstances, your level of happiness remains remarkably constant over time. This happiness set point is believed to be caused by our tendency as humans to rapidly adapt to changes in our environment. This process of constant adaptation is commonly referred to as the hedonic treadmill or homeostatic control. In support of this theory, researchers found that happiness levels of lottery winners, although initially high, soon returned to their normal range of happiness. The same thing was found with paralysis victims, who were initially high on negative affect. If each of us has a happiness set point that concept challenges the viability of undertaking research or doing interventions designed to increase individual happiness. Despite the assertion that attempting to increase happiness is challenging, recent research has resulted in some important new developments regarding the happiness set point. Diener et al. (2006) provided a revision of the original hedonic treadmill theory. This information was based on an evaluation of data from the Victoria Quality of Life Panel Study and the 1990 World Value Survey. Happiness set points are thought to be above neutral, with most people being relatively happy a significant portion of the time. Happiness set points may differ from individual to individual. Life satisfaction, positive affect, and negative affect may each have their own unique set points. Each of these may also exhibit different rates of hedonic adaptation. Certain life events such as the death of a spouse or the onset of a disability can result in significant changes to one’s happiness levels. Looking at these revisions we can surmise that happiness may actually be quite amenable to intervention. Richard St. John, a marketer and success analyst talks about the idea that success is not a one-way street but a constant journey. In his Ted Talk, St. John talks about his personal journey of success. St. John talks about the concept of reaching success and the fact that the work does not stop once you reach this point. In order to continue being successful, you have to constantly create new ideas and new passions. You have to remember why you started doing what you are doing in the first place. If you reach the pinnacle of your success and stop – you will not be able to keep the success going. Each of us is taught at a young age that achieving certain milestones of success in life is important. We work to do well in school, work to get into college, work to have a prestigious career, and then work on living in the right house or marrying the right person. This happiness and success quest continues throughout our lives. There is a misconception that each of these things will make us happy. The truth may very well be that none of these things really have anything to do with our level of happiness. What really happens is we reach our individual goals and feel happy for a while. Eventually, we discover we need to set new goals to achieve an even higher level of success to get the same buzz. All of this begs the question – does success bring happiness and fulfillment? Our achievements have their own set point. When we achieve them, we feel happy but this happiness doesn’t often last. Once the condition is met, we start looking for that next goal to pursue. What we might eventually discover is the idea that happiness is not at all related to setting goals and achieving them, but in finding that sense of happiness and joy within ourselves and in our daily life. If you really think about it you might start to surmise that success does not create happiness, but happiness can create success. Those who are extraordinarily happy may even attract success with their positive attitude and enthusiasm. If you really had to choose between pursuing a list of achievements that might make you happy to feeling happy and letting success come to you naturally, which do you think would be simpler in the end? Knowing this, it’s also important to examine some things you can do to feel happy at the moment. Expressing gratitude and feeling grateful can go a long way to happiness and joy. You can be thankful for many things such as your health, your children, your home, or even the fact that you have food to eat. Thinking about the good things in life and stopping to smell the roses along the way can help you feel happier in the moment. Keeping your brain active by practicing something challenging is another good tip. Learning a new language, or playing an instrument or even learning yoga, can help you activate your natural endorphins or feel-good chemicals in the brain. Try doing something you can improve upon to challenge yourself. Making powerful connections and connecting with other people is integral to your level of happiness and fulfillment in life. It doesn’t matter if you connect over the phone, or in person, just the act of connecting can help you feel better. Those who don’t continually put things off until tomorrow may also be happier. Getting things done helps you feel proactive and prideful. When you get things done, you feel a sense of accomplishment, which can help you feel happier. Never stop learning or being curious! Reading a new book, watching a documentary or having meaningful conversations can help you feel better too. Being open to new experiences can also help you boost your level of happiness. It doesn’t matter if you are trying a new food or trying out something like scuba diving. Trying new things can be fun and encouraging. Expressing physical affection is also important. According to Virginia Satir, a respected American therapist, each of us needs four hugs a day just for survival! Eight hugs a day are suggested for maintenance and twelve hugs a day are suggested for growth. Hugs create a sort of trickle-down effect and release of oxytocin, which can reduce stress and elevate your mood. Developing compassion is also important. Those who are interested in other’s lives and other’s stories are usually happier than those solely concerned with themselves. Try doing little random acts of kindness for strangers or those you love, and notice how that makes you feel. Strengthening your relationships is also important for your happiness. In one 80-year long study of 268 Harvard undergraduate males, researchers looked at every aspect of life from lifestyle to political views. Scientists began tracking Harvard sophomores in 1938 during the great depression. They hoped that the longitudinal study would reveal clues to leading a happy and healthy life. What they discovered was that relationships and how happy we are in these relationships have a very powerful influence on our health. Close relationships mean even more than money or fame, and relationships are what keep people happy throughout their lives. These important ties to other people help protect us from life’s discontents. They also protect us from mental and physical decline. What this tells us is that relationships are integrally important for both our happiness and well-being. Making it a habit to nurture your closest relationships and letting go of those that cause you pain or those that feel toxic can go a long way to helping you live a better life (Cherian, 2018). These may seem like simple things, but they can make a big difference when it comes to your level of happiness. Getting a promotion, a new relationship or winning the lottery will only provide a temporary boost when it comes to happiness. Each of has a baseline or a set point we continually return to when it comes to happiness. Maintaining a sustained level of happiness takes a little effort. Trying these exercises on a regular basis is a wonderful way to build lasting happiness and joy. Gratitude is a wonderful practice to engage in. Try writing down three things for which you are grateful for every day. These can be simple mundane things or big things. The point is to get something down on paper, every day. Writing down statements of gratitude, even on your worst days, can help you focus on the positive aspects of your life. Acts of Kindness are another thing you can do. Making a conscious effort to do something nice for someone for no reason at all can help you feel good. You might be shocked at how a simple act of kindness can turn your whole day around. Exercise has many positive effects as well. Being physically active can help you increase your energy, boost your immune system, and give you a sense of accomplishment. Exercise can also reduce insomnia, stimulate brain growth, and act as an anti-depressant. Try taking a walk or a bike ride the next time you feel you need a boost. Meditation has been linked with reduced anxiety and more positive emotions. Those who meditate on a regular basis may even permanently restructure their brain to create a sustained level of happiness. Taking the time to engage in positive journaling is another happiness booster. Writing about the happy events in your life, or writing about a good day with friends can help you get into the habit of focusing on the positive. Strong social connections and fostering relationships can also help you feel happier. It turns out that strong social connections are thought to be a powerful influence on our mood. Those who dedicate time to spend with family or friends tend to show the highest levels of happiness. If you can’t spend time with someone in person, pick up the phone or send an email. Nothing is more powerful than spending time with those you care about. 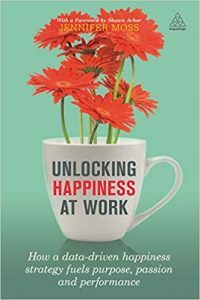 Unlocking Happiness at Work (Moss, 2016) is based on two decades of scientific research, real-time data, interviews, and case studies. The book seeks to debunk the myth that happiness at work is wasteful. Provide a greater sense of purpose. Moss talks about how to be happier and make others happier through the power of habits, emotional intelligence and an innovative approach to work/life flow. The book contains valuable case studies from companies like The Body Shop, Misfit Inc., Zappos, and Lululemon. According to Moss, we are looking at happiness all wrong. In Moss’s opinion, happiness is a choice we must consciously make every day. Moss infers that society has fallen victim to false branding when it comes to happiness. Cannot be attained or achieved. The more we pursue happiness, the harder it is to obtain. Happiness, in Moss’s opinion, comes after you work on building up traits like resilience, efficacy, optimism, hope, gratitude, and empathy. So much of our time is consumed with work, that it behooves us to look at ways we can pursue happiness where we spend the bulk of our time. More simple actions repeated every day have the capacity to achieve complex results, according to Moss. By building positive habits we can turn the emotional state and bundle the fast-firing neurons in our brain to make happiness a permanent trait. Drawing from the science of neuroplasticity, habits are built by modifying and repeating behaviors until we can move our conscious actions into the subconscious mind. The book encourages us to focus on building new habits, one at a time. Although this may take a little time, according to Moss, once happiness is achieved the positive impacts are felt almost immediately. To experience the book yourself, you can purchase it from Amazon. Get into the habit of thanks. Get into the habit of you and putting yourself first. Connecting with your peers and taking steps to get to know them better can go a long way toward building happiness. Moss suggests using your coffee break time to socialize at least once a week. She also suggests finding opportunities to drop by someone’s desk you are not familiar with to say hello. A quick connection might also lead to more opportunities for collaboration. It’s also important to get into the habit of saying thanks. You can do this by sending out a quick email of thanks before you leave for the day or texting someone about a job well done. A little praise goes a long way. Taking a walking meeting is also a great option. We often feel tied to our desks, so walking and talking is a great option to get the juices flowing. The more we get up from our desk and stretch and move, the more productive we are. Finally, Moss suggests getting into the habit of you. What this really means is learning to put yourself first. Taking 20 minutes to read something that provides nothing but joy, taking 5 additional minutes to have a cup of coffee or enjoying a 15-minute nap can help you feel better. Starting with small bits of time can give your brain the rest it needs to be more productive for the rest of the day. Emotional control and good leadership, according to Moss, comes with a well-rested and productive brain. Moss (2016). Happiness can even help us navigate change more effectively, according to Moss. Seppala also talks about the importance of building resilience and the ability to generate more inner peace, to stay calm in the face of chaos and to remain emotionally intelligent as we communicate with others. We must cultivate this even in the midst of conflict or hurt feelings. All of this helps us make good decisions even when we’re feeling upset. Engaging in an activity that helps train the nervous system to be calmer. Doing so helps us calm that overwhelming feeling and navigate the ebbs and flows of life. There are many, many great books written about happiness and success. The Magic of Thinking BIG – David J. Schwartz, PH.D.
Dale Carnegie’s famous book “How to Win Friends and Influence People” is a classic. He talks about the importance of mixing business and personal relationships in terms of them being inseparable. Carnegie shows us to how to go after the job we want, and get it, how to take the job we have and improve it and how to take any situation and make it work better for us. Twelve ways to win people to your way of thinking. Nine ways to change people without arousing resentment. The book can help you achieve your maximum potential. The 7 Habits of Highly Effective People by Stephen Covey explains how developing better habits can help make you a better person. Habit 5: Seek First To Understand Then Be Understood. Dr. Covey’s 7 Habits book is both inspiring and impactful. The Magic of Thinking BIG by David J. Schwartz, PH.D. is another classic. Schwartz is an expert in motivation and shows us how to get the most out of life. Believe in your own success. Cure yourself of the fear of failure. Believe that you are what you think you are. Make your attitudes your allies. Learn how to think positively. Use goals to help you grow. In the end, magnifying your thinking strategy can be a great recipe for success. Think and Grow Rich by Napoleon Hill is another classic. Hill interviewed “40 millionaires” in order to discover the common thought processes and behaviors that contributed to their amazing success. Hill’s study of these “best practices” was revolutionary for the time it was published in 1937. In the book, Hill talks about a 13-step program that will set you on the path to wealth and success. Called the greatest motivational book of all time, the book outlines the path to success for hundreds of America’s most affluent people. Daniel Pink, the author of “When: The Scientific Secrets of Perfect Timing” believes that timing is everything. According to Pink, the time of day can have a big impact when it comes to the decision-making process. Timing can also come into play in how well we learn and our ability to be effective and productive. Pink’s research is drawn from psychology, biology, and economics. Pink offers helpful strategies in how we can best time our lives to succeed. The book also offers strategies for self-improvement and helps us understand how we can we use hidden patterns of our day to build the ideal schedule. Sonja Lyubomirsky, author of “The How of Happiness – A Scientific Approach to Getting the Life You Want” describes the theory behind the “40 Percent Solution”. The book also introduces a dozen research-based happiness activities showing you ways to achieve lifelong happiness. According to Lyubomirsky, happiness is the Holy Grail of science. In her research, she not only presents the scientific literature but also has a self-help component where she gives advice and recommendations on what to do based on research results. Some of the research-based exercises in the book include things like practicing optimism when imagining the future, instructions in how best to savor life’s pleasures in the here and now and a thorough explanation of the importance of staying active to be happy. Martin Seligman is a University of Pennsylvania professor who is considered one of the founders of the positive psychology movement. Flourish provides a visionary new understanding of happiness and well-being. Engagement with what one is doing. The book is filled with research and stories that help illustrate each component. It is a rich resource for living a life that makes you happier. The book “Thinking Fast and Slow” is all about those conscious and unconscious thinking patterns. Winner of the National Academy of Sciences Best Book Award in 2012, amongst other awards, Daniel Kahneman, a renowned psychologist and winner of the Nobel Prize in Economics, takes the mind on an incredible journey as he explains the two systems that drive the way we think. Kahneman describes system 1 as fast, intuitive and emotional and system 2 as slower, more deliberate and more logical. The book talks about the overconfidence on corporate strategies, the difficulties of predicting what might make us happy in the future and the profound effect of cognitive bias. The book also reveals how we can tap into the benefits of both parts of our mind to facilitate change. The Power of Habit written by Charles Duhigg, a New York Times award-winning journalist blends the power of research, stories, and revelations about habits and how we can use them to transform our thinking. Named one of the best books of the year by The Wall Street Journal, the book shows how understanding our habits can help us. Shawn Achor, the author of The Happiness Advantage, suggests that happiness fuels success, not the other way around. Published in 2010, the book helps you think differently in terms of what happiness and success are truly about. According to the book, chasing after success, in the hopes that it will make you happy is not a plan that works for most people. The book focuses on strategies that help create happiness in the moment while capitalizing on its many benefits when it comes to becoming more successful. Many of us think that when we hit that next sales target or lose that five pounds that we will then be happy. We have learned to put success first and happiness second. Achor believes that formula is broken. He promotes happiness first, success second. In Achor’s opinion, happiness leads to success much more than success leads to happiness. According to the author, we become more successful when we are happier and more positive. Why we have the formula for success backward. How happiness can improve our physical health. How we are primed for high performance. How happiness can undo the negative aftereffects of stress. How we can become happier and believe change is possible. Using meditation as a permanent happiness boost. The benefits of physical exercise. Turning away from the news. Realizing money can buy happiness if it’s spent on experiences versus things. According to Achor, more than a decade of groundbreaking research in the field of positive psychology and neuroscience has proven that the relationship between happiness and success works the opposite of what we think, which is very refreshing thought. Today is life–the only life you are sure of. Make the most of today. Get interested in something. Shake yourself awake. Develop a hobby. Let the winds of enthusiasm sweep through you. Live today with gusto. Until you are happy with who you are, you will never be happy with what you have. When it comes right down to it, both happiness and success are interconnected in a sense. Happiness affects your level of success and your level of success affects your happiness. Happiness is really a choice you can choose to make. Many of us are so wrapped up in trying to get ahead that we forget that we can choose to be happy in the moment. You can steal time out of your day to simply take a walk and enjoy nature. You can hug a friend or sit with a cup of tea. You can take stock of your life and realize that you are very lucky to be exactly who you are. Things don’t always make us happy nor does money or possessions or that perfect job. Relationships don’t necessarily make us feel happy if we are not already feeling that happiness within. When it comes to the relationship between happiness and success, we can surmise that success is something we pursue while happiness is something we acquire. According to Boehm and Lyubomirsky (2008) past research has demonstrated a relationship between happiness and workplace success. Happy people earn more money when compared to their less happy peers. Happy people also tend to display superior performance and perform more helpful acts. Past research has often assumed that an employee is happy and satisfied because he or she is successful. In the author’s review of the evidence, an alternative hypothesis may actually be more accurate, that happiness is a source of why particular employees are more successful than others (Boehm and Lyubomirsky, 2008). The authors conclude that the evidence suggests that happiness is not correlated with workplace success, but that happiness often precedes measures of success and that the induction of positive affect leads to improved work outcomes. In the end, we can’t always control our external circumstances because life is ever changing. The only thing we can have a say over is our state of mind. Whether or not you believe that happiness attracts success or not, choosing happiness is something you can do every day. Cherian, Dona. Gulf News; International Happiness Day: Science-backed ways to be happy. Dubai [Dubai]18 Mar 2018. Diener, E. (2006). Guidelines for national indicators of subjective well-being and ill being. Journal of Happiness Studies, 7, 397–404. Norby M. Brain-Based Behavior -- Our Choices Determine Our Happiness and Success at Work. Contract Management. 2013;53(8):14. http://librarydb.northwood.edu:2048/login?url=http://search.ebscohost.com/login.aspx?direct=true&db=oih&AN=89467886&site=ehost-live&scope=site. Accessed January 3, 2019. Winsor, S. Corn and Soybean Digest. How Do You Define Success? Overland Park (May 16, 2013): n/a.